You know when Christianity has really returned to Russia when Jesus Monopoly hits GUM, the Moscow state department store. 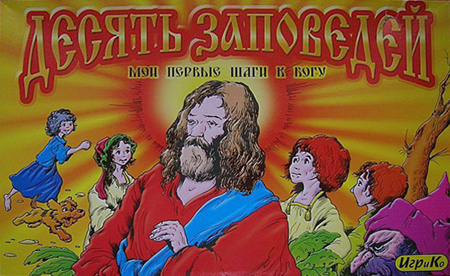 Jesus may look like a backstreet tramp on the game's box (and the purple dwarf in the bottom right corner has got biblical scholars scrambling to re-read the Gospels), but let's not quibble. In Jesus Monopoly, you play to win all 10 Commandments. If someone else has that missing "Thou shalt not commit adultery" card, then you can beg, steal or barter for it... probably breaking several of the real commandments in the process. Meanwhile, try not to land on one of the seven deadly sins squares. The game came to light on the excellent and entertaining English Russia website, who say, "It’s not quite clear was this game devoted to teach Christianity or to show the flaws of the concept." Jesus Monopoly. Reportedly just $2 from your nearest Russian toy store. Thanks to Albert Ross for finding this gadget.